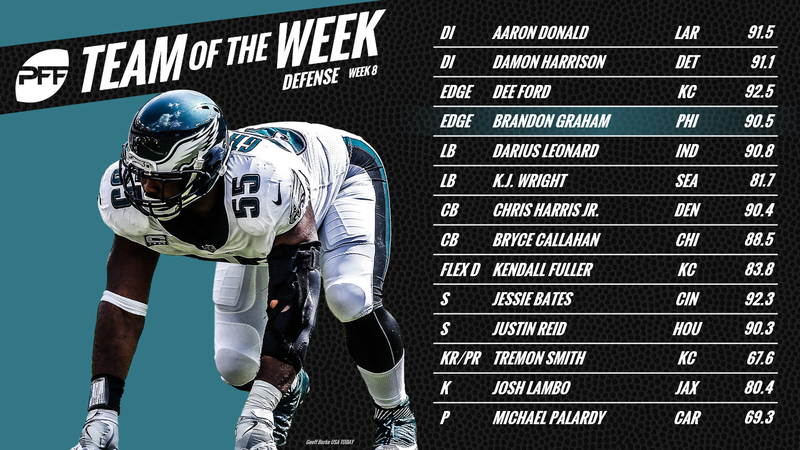 Here, we’ve looked past box-score totals and unearthed the hidden gems in the PFF databases that are key stats to know following Week 8 of the 2018-19 NFL season. 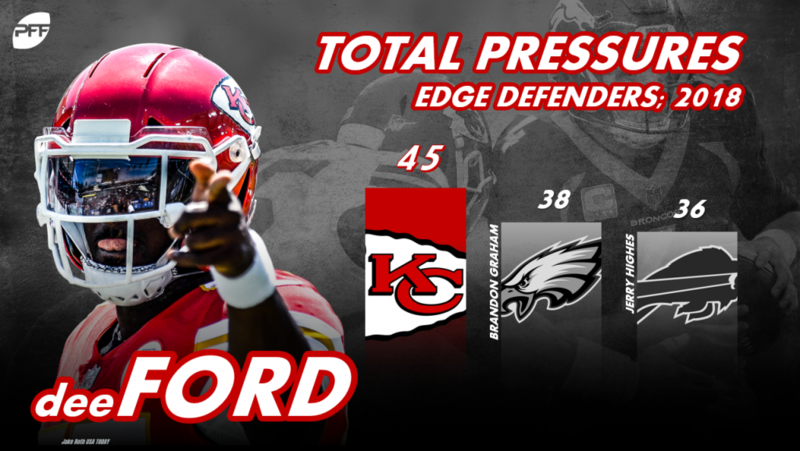 Kansas City Chiefs edge defender Dee Ford has gone from an afterthought a talent-laden AFC West to NFL superstar. He currently leads all qualifiers at his position in overall grade (90.5), pass-rush grade (91.9), pressures (45), win rate (20.5%) and pressure rate (18.8%). Among the 37 quarterbacks with 25-plus attempts of 10-plus air yards, Minnesota Vikings‘ Kirk Cousins ranks first in passer rating (146.6). Yes, the receiving talent has played a role in the high mark, but give credit where credit’s due for new Minnesota signal-caller. Big Snacks didn’t disappoint in his Detroit Lions debut. Damon Harrison recorded five run stops against the Seattle Seahawks in Week 8, which tied for the most among all interior defensive linemen this past week. Through Week 8, Los Angeles Chargers rookie safety Derwin James has allowed just 22 total yards and two first downs and logged an interception from nine targets when targeted as the primary coverage defender against an NFL tight end. His 12.0 passer rating when targeted ranks first among the 42 safeties with five-plus targets against tight ends. Cincinnati Bengals‘ A.J. 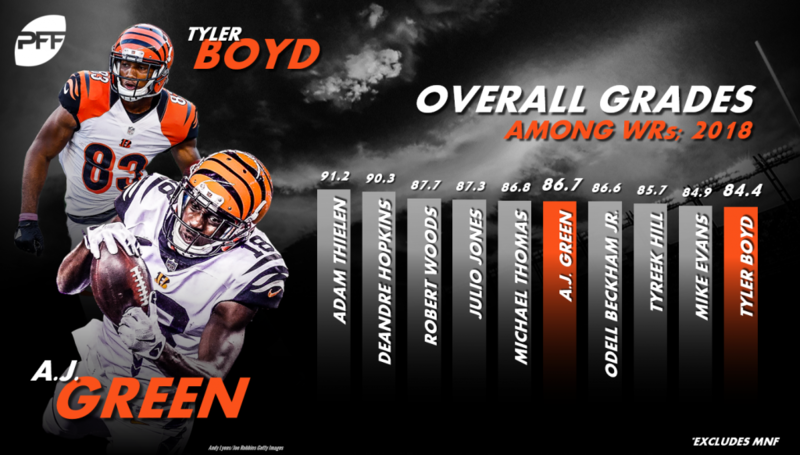 Green and Tyler Boyd have come together to form one of the NFL’s best wide receiver tandems through Week 8, and they’ve done so with high-end efficiency on third and fourth downs. Boyd has picked up first downs or touchdowns on 60.9% of his targets on third or fourth down this season, ranking third among qualifying wideouts. And Green isn’t far behind, ranking 12th at 52.9%. Carolina Panthers rookie cornerback Donte Jackson has allowed just five receptions from 17 targets for 125 yards, five first downs and three interceptions on passes of 10-plus air yards. As a result, he leads all 49 cornerbacks with 15 or more targets of such depths in passer rating allowed (17.9). Defending pass-catchers out of the backfield, Baltimore Ravens‘ C.J. Mosley has allowed just 2.70 yards per target, ranking first among the 38 linebackers with at least 15 targets against pass-catchers running routes from a backfield alignment. 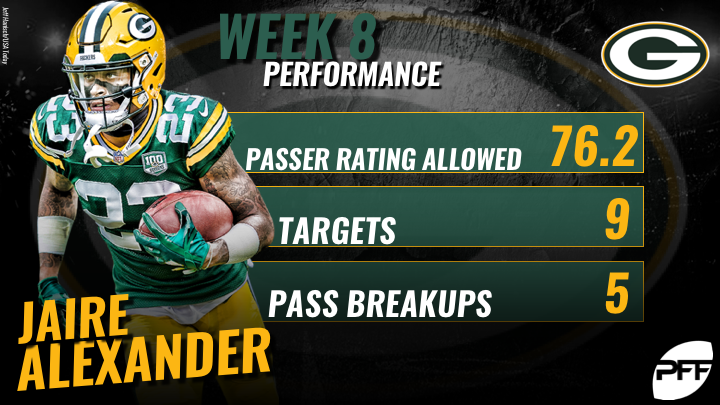 Going against one of the NFL’s most prolific offenses fitted with high-end receiving talent, Green Bay Packers rookie cornerback Jaire Alexander earned a career-high single-game coverage grade (82.6) and recorded five pass breakups in Week 8. Alex Collins, though more than capable of churning out yards after contact and forcing missed tackles, has gained 89.4% of his rushing yards on carries where he’s been contacted two-plus yards beyond the line of scrimmage — good for the highest percentage among backs with 60-plus carries. 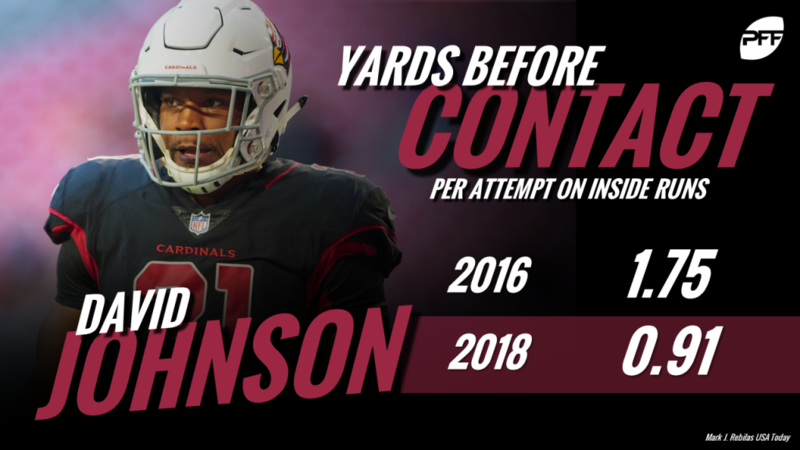 Arizona Cardinals running back David Johnson has been contacted at or behind the line of scrimmage a league-high 70 times this season, or 57.4% of his carries (third-most). The blocking up front has been far from what it was in his career year in 2016, and his box-score production is paying the price. Denver Broncos running back Phillip Lindsay has gained a 52.2% of his rushing yards before first contact, which leads all NFL backs with at least 60 carries on the season. Through Week 8, San Francisco 49ers rookie offensive tackle Mike McGlinchey leads all offensive linemen — not just offensive tackles — in run-block grade at 88.6. The former Notre Dame mauler has seemingly picked up right where he left off. On passes of 2.6-plus seconds, Packers’ David Bakhtiari has allowed just seven total pressures across 163 pass-block snaps. His 97.9 pass-blocking efficiency leads the 50 offensive tackles with at least 100 pass-block snaps where the pass has been thrown 2.6-plus seconds after the snap. Running routes of the backfield, Chicago Bears running back Tarik Cohen has caught 21 passes for 307 yards, 10 first downs and two touchdowns. He averages 3.34 yards per route run from a backfield alignment, which leads all 43 running backs with at least 70 routes run out of the backfield this season. Four picks into his duel with the Bengals in Week 8, Jameis Winston took his talents to the pine, as the Bucs benched the former No. 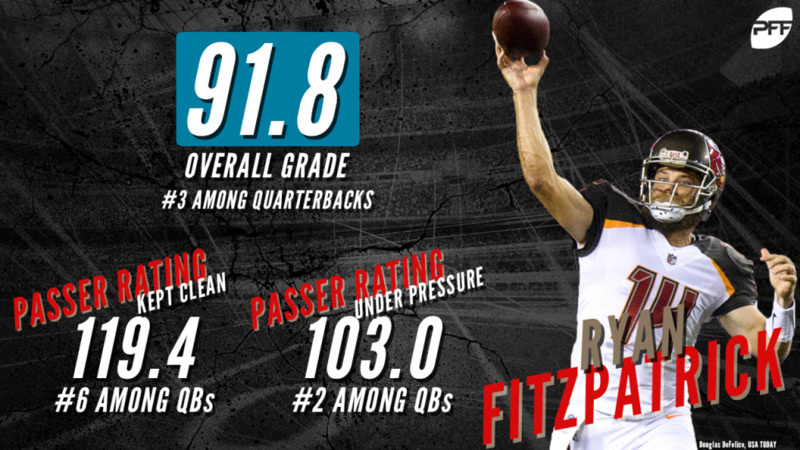 2 overall pick in favor of the 35-year-old wily veteran, Ryan Fitzpatrick. Dubbed Fitzmagic for all the right reasons, the former Harvard grad has been among the league’s best when he’s taken the field this season. Fitzpatrick ranks second in overall grade (91.8) among qualifying quarterbacks and ranks tied for ninth in big-time throws (nine).